girly things overload. | escaped. Guys, sod off. Don't say I didn't warn you. Posted this on Instagram (which is the new 'in' thing in social network right now) a few days ago, so it's not exactly new..but what the heck. I'm falling in love with HELLO KITTY. Like, I can't resist myself from buying all stuffs related to it. 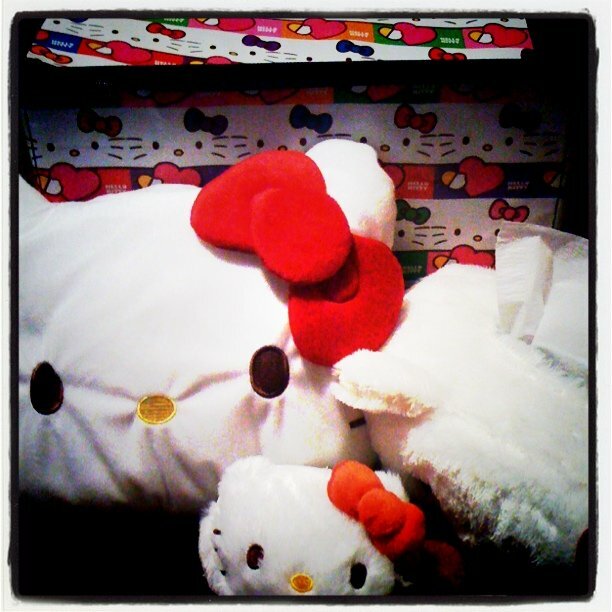 Hello Kitty keychains, pillow covers, pillows, tissue box cover, etc. Suddenly I can see Hello Kitty stuffs everywhere - even the grocery store in front of my house where I've been for 4 years, I just realize they have a whole collection of Hello Kitty stuffs (not entirely, but enough!) so I knew right there and then, I'm obsessed. Especially if you know me. All kinds of anime characters/cartoon/figurines seriously are NOT my thing. I don't get why guys love to buy all the Sailormoon's figurines, I don't get why guys keep stacks of manga in their room, heck I don't even get why girls love Barbie dolls. But now I know why. Or at least, the feeling. I fell in love with Hello Kitty when I first saw a handmade pouch souvenir with Hello Kitty face on it in Kyoto, and I thought I've never seen anything cuter than that little thing. The pouch costs 600 yen each, and I thought it's too expensive (well hello, handmade. Pfft) so I didn't buy it. 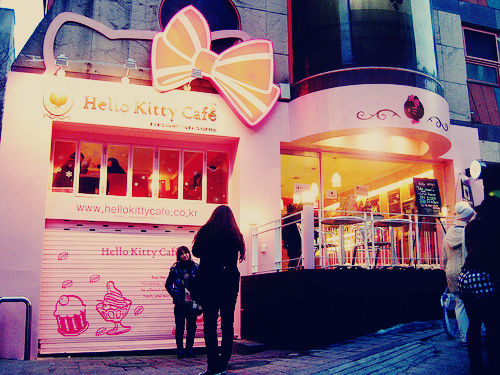 But now I feel like rushing to every store here (AND I'M LIVING IN JAPAN, SURROUNDED WITH HELLO KITTY STUFFS!! SERIOUSLY NOT GOOD FOR MY PURSE..NOT GOOD) and buy all Hello Kitty stuffs and redecorate my whole house. Bought this Hello Kitty fukubukuro for 2000 yen. I've never felt so guilty in my life, spending money to buy things just because it's cute..but I. Just. Can't. Resist. I guess that's what Japan does to you..good thing I'm graduating soon. If I found a store like this, I might faint. And wake up with happiness. But I know for sure my boyfriend would faint if my room turned out like this. Stumbled on your blog and especially love this post ... because I UNDERSTAND 100%! I'm obsessed with hello kitty and any where I see it I WANNA BUY !!!! heheh. 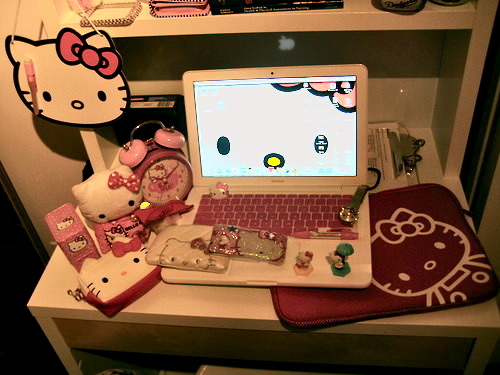 OMG thank God, I thought I was the only one going around obsessing with hello kitty..hahaha.